I recently made fabric boxes with this tutorial here and needed some bias tape to finish the edges. I needed nearly 4 packages for 4 fabric boxes and at $2.99 each. Yikes!! That would really drive up the cost. I decided to learn how to make bias tape instead. Besides being cheaper, making your own bias tape opens a world of pattern and color choices. I, however, decided to go for a plain yellow cotton this go around for only $3 a yard. First, lay out your fabric on the cutting mat so the selvage is butted up against the vertical marked edge of the cutting mat. (The selvage is the woven edge parallel with the lengthwise grain.) Line up the cut edge so it is on the horizontal marked edge of the cutting mat. If it isn’t totally square, trim off the edge so it lines up. 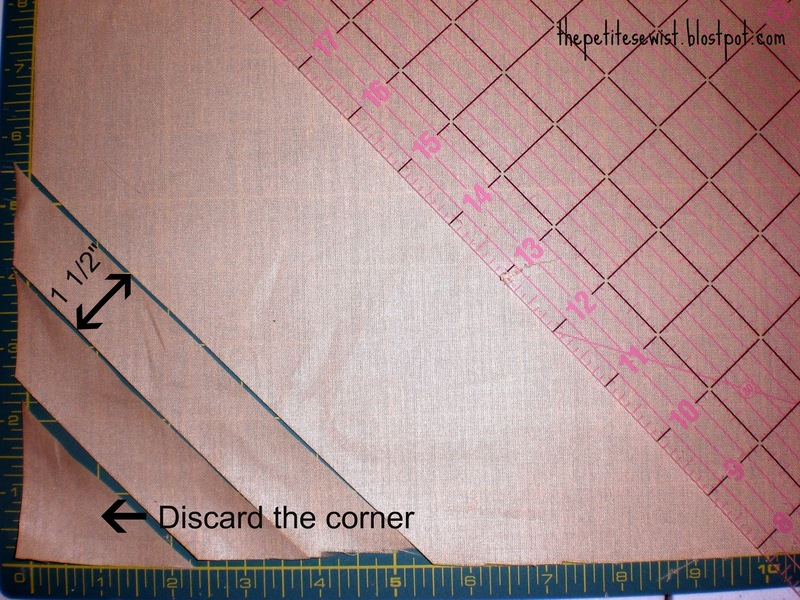 You won’t be needing the selvage in your bias tape, so using your ruler, cut 1/2″ off the selvage and reposition it with the vertical edge of the mat. Now you’re ready to get started. If you’re left-handed like me, you’ll want to start slicing on the left side. With your rotary cutter, slice a triangle off the corner edge 2″ x 2″ and discard. It’s too small to work with. 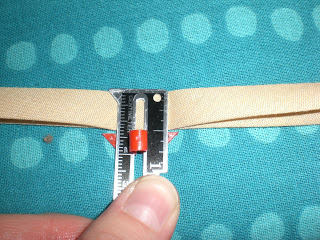 Then, measure 1 1/2″ along the sliced edge, line up your ruler, and slice it off. Keep slicing strips until you have enough for your project. 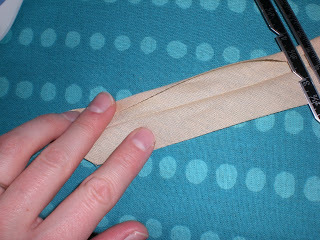 To sew the strips together, line them up right sides together so they form a ‘V’. 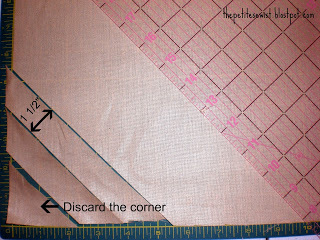 Then, move them past each other a bit so that there is room for a 1/4″ seam allowance. Sew along the dotted line, shown above. 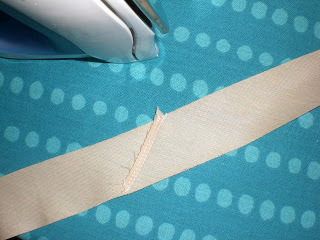 Match up all your strips, sew them together in a line, and then head to the ironing board. 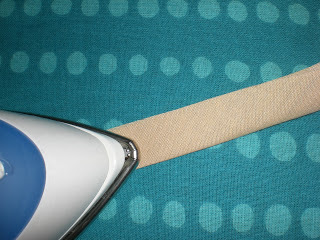 Iron the seam you just made to one side. I added an extra row of stitching at 1/8″ to prevent fraying. 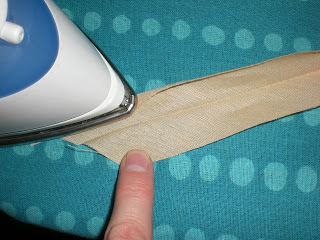 Now, fold your strip in half, ironing all the way down. Open the strip back up. 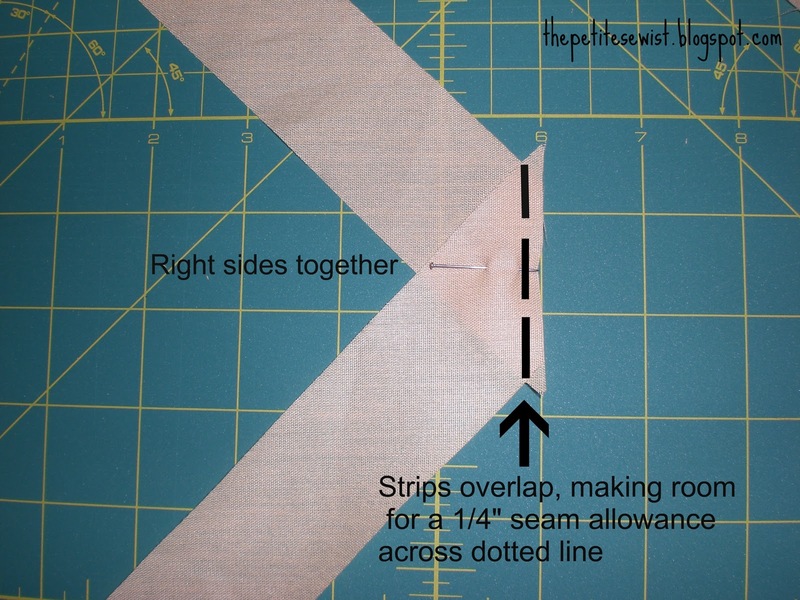 Measure and fold 1/4″ in at the edges on both sides. Iron the folds in on both sides. To be honest, I eyeballed the fold most of the time. 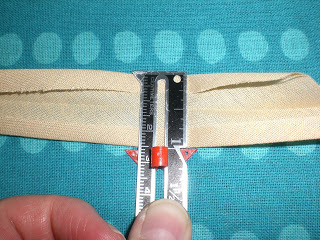 If you didn’t have a crease in the center, your bias tape would be 1″ wide. This is 1″ single-fold bias tape. I’m really excited to have figured this out finally!! See, all I had to do was fold it back in half! If you are going to be making a lot of bias tape, it may be wise to purchase a bias tape maker. They cost under $10 and fold the sides in precisely. 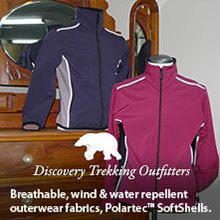 All you’ll need to do is iron the creases. Sha-zaam!